Historically, this organic gem material referred to as Ivory came only from elephant tusks. Since elephants have become a protected species and the sale of elephant ivory has been outlawed, most of the ivory we see being used in jewelry today comes from fossilized sources along with hippopotamus, narwhal, sea lion, and wild boars teeth. Ivory exhibits a distinctive graining that is referred to as the “engine turned effect.” This helps to distinguish ivory from bone. As ivory ages in changes from its original white color to yellowish and eventually it acquires a brownish patina. Valued for its ability to be carved, many fine ivory carving traditions existed throughout the world. Netsukes in Japan, Victorian carvings, the Erbach school in Germany, and in Russia they have been carving mammoth and walrus ivory for centuries. 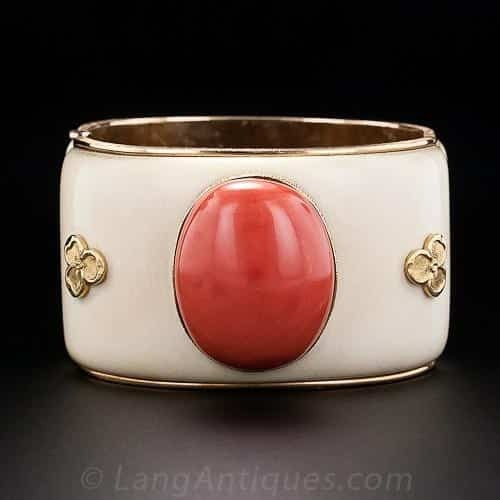 Mario Buccellati Ivory and Coral Bangle. Gems & Gemology: The Quarterly Journal of the Gemological Institute of America. Winter 1948, Ivory or Bone, by Webster, p. 105, 6pp. Summer 1949, Vegetable Ivory, by Webster, p. 179, 5pp. Fall 1962, A Jeweled Ivory Elephant, p. 345, 2pp. Spring 1969, Vegetable Ivory, p. 29, 1p. Fall 1969, Hornbill Ivory, p. 98, 2pp. Spring 1970, Vegetable Ivory (? ), p. 149, 2pp. Spring 1970, Mammoth Ivory(? ), p. 159, 3pp. Spring 1971, Mammoth or Elephant Tooth Snuff Bottle, p. 274, 1p. Fall 1971, Vegetable Ivory, p. 356, 2pp. Fall 1973, Hornbill (Ho-ting) Ivory, p. 208, 8pp. Summer 1975, Scrimshaw on Whale Teeth, p. 44, 2pp. Summer 1975, Hornbill Snuff Bottle, p. 48, 1p. Winter 1976, Corozo Nuts, p. 127, 1p. Fall 1976, Assembled Hornbill, p. 210, 2pp. Spring 1979, The Renaissance of the Art of Scrimshaw, by Jerolyn Dirks, p. 142, 5pp. Fall 1979, An Ivory Imitation Described as Microcrystalline Cellulose, p. 200, 1p. Fall 1980, Remodeling the Ivory Tower, Protecting Elephants from Extinction by Using Substitutes, by Cheri Lesh, p. 360, 3pp. Fall 1980, Trade restrictions on Ivory, p. 370, 3pp.